The fast-growing Lakeville school district gets some much-needed classroom space Tuesday when it opens a second high school. 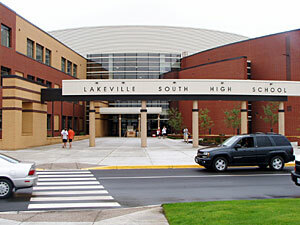 With a capacity for 1,800 students, Lakeville South is considerably smaller than many suburban high schools. The $60 million project reflects a new approach in classroom design that moves away from the mega-school concept. Lakeville, Minn. — Construction workers were putting the finishing touches on the main entrance area at Lakeville South High School recently. Principal Scott Douglas was confident about the work being done in time for the start of the school year. "We're going to be ready to open and meet the needs of the students the first day of school," Douglas said. "We have little things that some people may see and some people may not see, that are going to be completed in the month of September. But as far as being operational and being able to deliver education to kids, we're good to go and we're ready to go." Douglas walks proudly through the wide hallways of Lakeville South. He talks about the school's many features. There's a large, open commons area that rises three floors. The auditorium seats more than 1,000. Teachers share a large office area designed to foster collaboration. The key feature of a high school these days is its security equipment. "We have a closed-circuit digital camera system," Douglas said. "We have 80 cameras throughout the building and in the parking lots, and we'll be able to monitor it 24/7 electronically." Lakeville South will house about 1,300 students in ninth through 11th grades this year. The enrollment will grow to 1,800 next year with the addition of 12th grade. The class of 2006 will stay together this year at the old school, now known as Lakeville North. Students like 11th grader Paul Hilsen are anxious for classes to start. "At first we all were kind of bummed that we're splitting up from our friends at Lakeville North," Hilsen said. "But as everything kind of came into progress, we're excited to be in a brand new school and be able to start new traditions and make it what we want it to be." The school is designed with students and learning in mind. Classrooms are divided into six clusters of 12. Scott Douglas said the idea is to make the school feel smaller than it is. "The community's expectation is that we try to keep our student population under that 2,000 mark, and that we give our students a more personalized educational experience," Douglas said. "Our commitment is to do that. You look at many of the schools, the Eden Prairies or the larger suburban schools that are running with with a larger population, we feel our students will get a better education being smaller." When it comes to high schools, education reformers make a strong case that smaller is better. They point to research showing higher graduation rates and lower disciplinary problems in small schools. For many people, 1,800 is still a pretty big school. Joe Nathan, director of the Center for School Change at the University of Minnesota's Humphrey Institute for Public Affairs, advocates that high schools house fewer than 500 students. Nathan sees more school districts trying to scale down their schools, but many fail. He said sports often get in the way. "I've had superintendents tell me 'Joe, you're right. But I want to have one high school rather than two or three, because we'll have a better football, basketball and hockey team, and this is really important to people in our community,'" Nathan said. "So one of the things is, how does the community feel about sports? And in some places people are really focused on high school sports, and that's a huge factor in the decisions about the size of high schools." Another fast-growing suburban district is building a new high school that will also be under 2,000 students. Shakopee will open a new $54 million high school in 2007 with a capacity for 1,600.